We live in the beautiful Northwest along the Columbia River where the Yakima and Snake Rivers join in. Our dogs live with us in our home or in a Guardian Home, and have constant companions amongst family and friends. We are not a kennel breeding operation. We believe your family companion should be raised in a family setting and the parent dog should be well socialized and people-oriented to pass these good temperaments on to their offspring. We also work with each puppy to bring family socialization skills into their daily routine. They are exposed to the everyday noises and activities, such as doorbells, vacuum noise, lawn mowers and excitement around the house with a family of six! 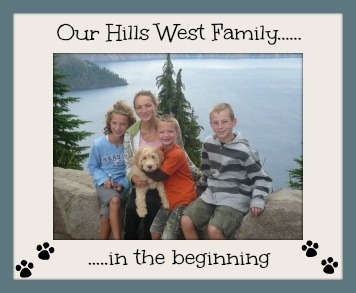 "Hills West Labradoodles" is an intimate in-home breeder which means we whelp and raise these adorable pups in our home with the enthusiastic help of our four children. Our dogs interact and are pampered and loved from all ages of people. They receive as much love as you would hope for in your newest family member. We want your new family member to have the very best start in life and that is why we pay special attention to quality genetic selection, care and socialization for each puppy. Proper socialization is extremely important, and each puppy’s genetics and positive start in life is the best guarantee for wonderful temperaments. We provide each puppy a healthy social, physical and mental start in life. We prepare them for the transition into their new home already exposed to a variety of sounds textures and field trips. We also educate our new owners on how to continue healthy family and social skills as they move from our home to yours. As Labradoodle breeders it is our desire to contribute to the quality and soundness of the Labradoodle, to produce allergy friendly family pets and to ensure the delightful temperament and breed standard of the Australian Labradoodle is continued. We are carefully selecting our breeding dogs from the finest Multigenerational Australian Labradoodle and American Labradoodle lines with four major cornerstones of quality in mind: temperament, type, color and coat. Our goal is to combine these attributes to make certain that you receive a family pet that will bring years of love, laughter, joy, and companionship into your home. ​All of our Labradoodle breeding dogs are tested to ensure genetic soundness and will be registered with the ALAA; the Australian Labradoodle Association of America. We are happy to share the testing results of any of our Labradoodles with prospective owners. All of our Labradoodle puppies come with a two year health warranty against genetic disease. We will adhere to the ALAA breed standard for our Australian Labradoodles as well as the American Labradoodles we infuse into our lines. Our Labradoodle puppies are born and cared for in our home, and are considered true members of the Family. We believe that what sets us apart is our love and commitment to our dogs, along with the special care they receive and exceptional environment in which they are raised.